This design team call originally was posted online by Simple Stories. Deadline to Apply is December 31, 2018. To apply for this call, visit the Keep It Simple website. Passion for creating art and projects with a broad knowledge of mixed media, and the ability and desire to grow as an artist and try new products. Proficient with excellence in photography and knowledge of video taping tutorials and classes. Must have prior design team experience with knowledge of typical duties and the mixed media art industry. Must work well under pressure and tight deadlines. Must have a current blog and YouTube account. unique colors and we expect our design team members to promote our paint solely in your online and print work. You must be able to contribute a minimum of 1 video tutorial and 2-3 blog posts per month. You must be able to commit to posting all your work for us on your social media, blog, and online galleries where permitted. Graphic design experience is not required, but a definite plus. Submit a combination of 4 projects/layouts…at least one MUST BE a project, or give us a link to a gallery on a social media account that features a good selection of your artwork. Make sure this is your best work and it epitomizes your unique style and abilities. Submit your resume, links to any online galleries, your blog, your social media accounts, and anything else you deem highlights the exposure of your art, social media, and ability to advertise it. Please indicate which design teams you are currently on. Tell us why you would like to be a BAD GIRL! What makes you a good fit for our team? What would you like for us to know about you? In the subject line please write “Design Team Entry/Your Name”. Include your name, address, email address, phone number. Artists will be notified by 09/17/18. We will have a meeting in September and your official term will begin! Luscious Design Team boxes will be shipping out the same week! You will receive all 27 colors of our Haute Mess acrylic paints, all of our Haute Mess mediums (Gesso, Moulding Paste, Matte Gel Medium, Glass Bead Gel, Clear Gesso), Gorgeous Haute Mess Art Journal, Gems, Stick Pins, Vintage Fabric and Papers, and more! You will receive our Private Line to design with. As we manufacture and release new lines you will also receive shipments with those contents. We will also be releasing random Limited Edition Kits. Some design team members may be eligible to design with these kits. A discount in our Shoppes of 30% off. Published projects with BAD GIRLS COUTURE signature products will be generously compensated. Amounts to be disclosed to Designers who become a part of our team. Opportunity to attend and teach at trade shows and retreats. Good Luck to all you BAD GIRLS!!! For more information on this design team call, visit the Bad Girls Couture blog. 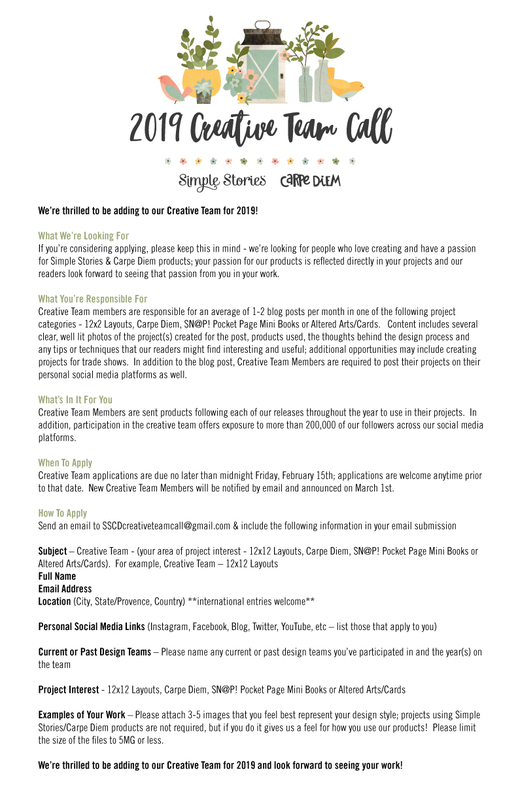 We are excited to announce the Design Team call is open to paper crafters, scrapbookers, and card makers. This is a fantastic opportunity to design with a leading manufacturer in the craft and hobby industry. We’re looking for 12 designers to work with our lines of premium adhesives and other craft materials. Makeover. One of the country’s largest (and at nearly 75 years old, one of its oldest) craft chains is undergoing a rebranding. The company long known as Jo-Ann Stores recently began calling itself “JOANN” in company announcements and has a newly redesigned logo and a fresh new shade of green as its signature color. In addition to the new cosmetic look, the new JOANN is also engaging in a branding campaign, promoting the hashtag #handmadewithjoann and launching a series of videos about creating and creators. In addition, JOANN has created a new mobile app that is much more community focused, allowing users to share their own creative projects. Partnership. Etsy has announced that it is launching a partnership with Printful that will provide print-on-demand integration to Etsy sellers. This will allow graphic artists to sell on Etsy and have Printful handle the logistics of printing and shipping items like t-shirts, mugs, hats, totes, wall prints, and other items. Support. Taylor Swift got support from an unexpected source during the recent trial in Denver over her successful civil suit alleging she was groped by a radio DJ during a fan meet & greet. The offices of Craftsy are right across the street from the Denver courthouse where the trial took place. The Craftsy staff showed their support for Swift during the trial with a series of Post-It note messages on the windows that were clearly visible from the street below. Swift’s unofficial girl squad at Craftsy did not go unnoticed – they received a delivery of flowers and a note of appreciation from the singer on Tuesday after the trial’s conclusion. Delinquent. The Tennessean reports that on the evening of August 8th, firefighters had to climb to the roof of the Dickson, Tennessee Hobby Lobby store to remove a 15 year old trespasser trying to use the store’s roof as an impromptu skateboard ramp. Calls. Tombow USA has a call open until September 11th to find members for their 2018 design team.